Being vegetarian or vegan in China, on the face of it, is a real challenge. Eating meat in Chinese culture is actually considered a sign of prosperity. Furthermore, in a lot of vegetable dishes minuscule pieces of meat are frequently used as garnish and people don’t really consider them as meat, but just as a mere decoration. That’s the reason why, when you specifically ask the waiters for a dish without any animal products, in most cases, they will first reassure you they will follow your wishes. You will be pleased to know that a lot of vegetables are used in Chinese cuisine. 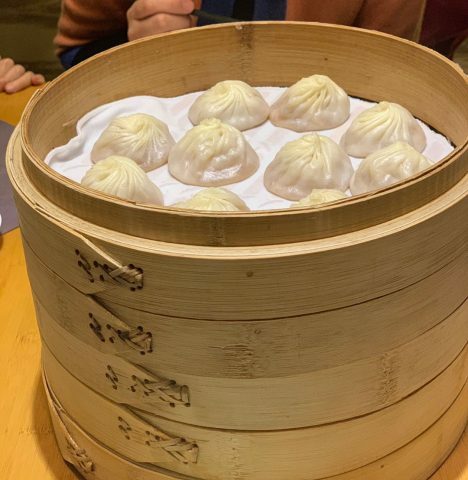 Even though the majority of the population in China is not vegetarian, there are some popular Chinese dishes you can easily find and eat because they are 100% made of food which is of plant origin. 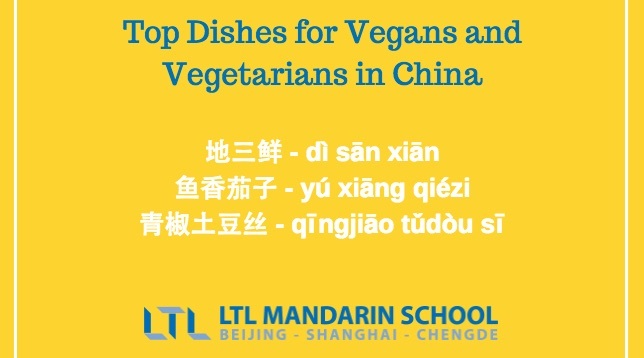 Before we move on with some key vocabulary here are LTL’s top five dishes for a Vegan or Vegetarian in China. Rest assured there are many more great contenders also! 1. 地三鲜 (dì sān xiān) – Stir-fried eggplant, chilli and potato braised with soy sauce. 3. 鱼香茄子 (yú xiāng qiézi) – Despite its name which means “fish-fragrant eggplants”, this dish is only made of crispy eggplants covered in a sticky sweet, sour, savoury and slightly spicy sauce. 5. 青椒土豆丝 (qīngjiāo tǔdòu sī) – Northern dish. Shredded green pepper and potato, lightly salted and fried with oil. The Chinese word for vegan is 纯素食者 (chún sù shí zhě) literally “a pure vegetable-ist” or “a pure vegetarian”. 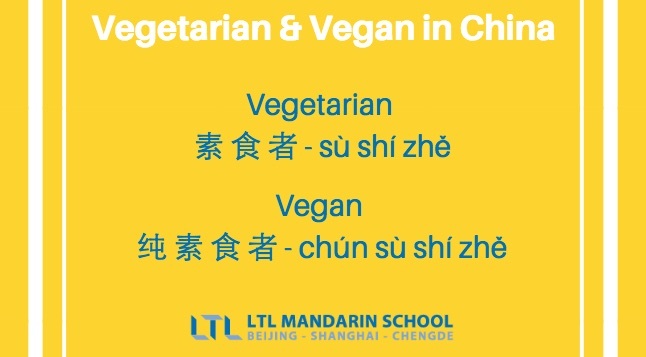 The word for vegetarian is 素食者 (sù shí zhě) literally “a vegetable-ist”. The 纯 “chún”(pure) defines the difference between vegan and vegetarian. Now we are going to take a look at some real life stories of LTL students, past and present. How did they cope in China as a Vegan or Veggie? I have to admit that I was worried about coming to China, as I knew Chinese people eat a lot of meat. At the beginning it was quite hard for me to find suitable food, especially as I could not read many characters on the menu of restaurants or in the supermarket. Secondly, asking my Chinese friends to show me some vegetable dishes in nearby restaurants. I knew what I could eat and not. After getting to know the authentic Chinese cuisine, I realized that there are loads of vegetable dishes and yummy tofu. There are even real vegan restaurants that offer fake meat like duck, fish and crabs. Definitely an interesting experience! MY MAIN TIP: When ordering food in a restaurant, it’s always better to ask twice if it has meat, fish, eggs, milk products etc! Just saying “I am vegan/vegetarian” is often not enough, as this concept is not so common in China. 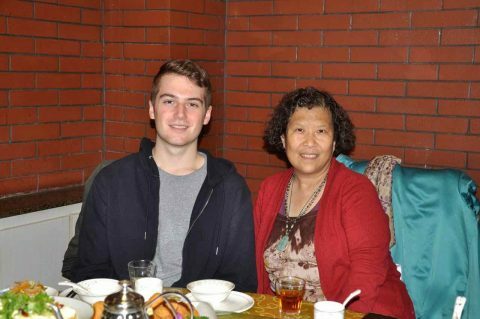 Thanks to Noah from Germany who studied Chinese with us at LTL for 4 months in total which involved some time in Shanghai and some in Beijing. Hello, my name is Meity and I’m doing the 5 weeks of Mandarin Classes at LTL Beijing. I am a pescatarian who doesn’t eat dairy, which did worry me a little when booking my trip out here. I was worried about being too shy to raise questions about food or even use my Chinese to ask if something had meat in it. After only 2 weeks of being here I have realised it’s really not anything to worry about. 1. Write down on your phone key phrases. Things like “no meat” or “does this have meat in it”. This would be even useful for people with allergies such at nuts. 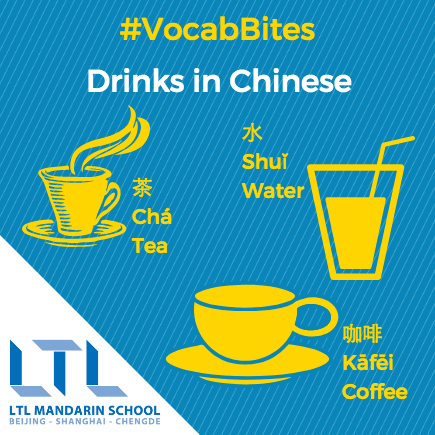 I would recommend writing down both the pinyin and characters, that way you can say it and if they don’t understand you, they can read the characters. This is useful for vegetarians/vegans travelling in general. It highlights all the local shops and restaurants which are either have veg options or are vegetarian/vegan. Its called translate which is the most useful thing I’ve learnt so far. You can take a picture and it will scan the characters and translate it for you. This is super useful for someone like me who doesn’t always have the courage to speak up in busy environments. It is also a good idea to know a few basic characters such as “meat” “egg” “ fish” . Often in Chinese restaurants the descriptions are super long, but if you can just pick out a character like meat or vegetable it will save you a lot of time. If you can’t find anything that’s suitable (hasn’t happened to me yet). You can always order a bowl of rice and some veg. They will be your vegan paradise. It’s also a chance to try mock meats. Hopefully this post has been of real use to you. Do you have any favourite Veggie dishes we may’ve overlooked? How do you get by in China as a Vegan or Vegetarian? Let us know and share your experiences below in our comment section. Stuck with a food allergy? Follow our blog on how to say Allergies in Chinese or Danger Zones for if you have a peanut allergy. There’s plenty more to come in the near future!